I’m re-reading Victor Hugo’s Les Misérables after 20 years. Start with part 1, or read on. Now that Valjean and Cosette are safely established at the convent, we move on to “Part Three: Marius” and jump ahead several years. Of course, we don’t start with Marius. Just as “Part One: Fantine” opened with the Bishop and “Part Two: Cosette” opened with the Battle of Waterloo, this section starts with street urchins. Marius isn’t even one of them. Paris has the best street urchins, or at least they did back in the good old days. Victor Hugo presents a fascinating, idealized description of the typical Paris urchin, then goes on to present the urchin as a microcosm of Paris, which he sees as a microcosm of — and the center of — the world. Let’s just say this won’t be the last time Hugo expounds on the wonders of Paris. There’s a lot of talk about the transition between city and country, in-between places that are both but neither (briefly discussed in other chapters). That’s something I’m not super-familiar with, having grown up in southern California in the 1980s. The sprawling suburbs stopped abruptly at a big industrial farm (most of which is gone now), and if we went hiking or camping, we drove from solid city to solid country, and skipped right past the transitional areas. Adding to the coincidences: Their next door neighbor is a penniless student named Marius, whom we’re told will be the next subject of concern. Except that he isn’t. The next chapter is about Marius’ grandfather. Pages covered: 495-511. 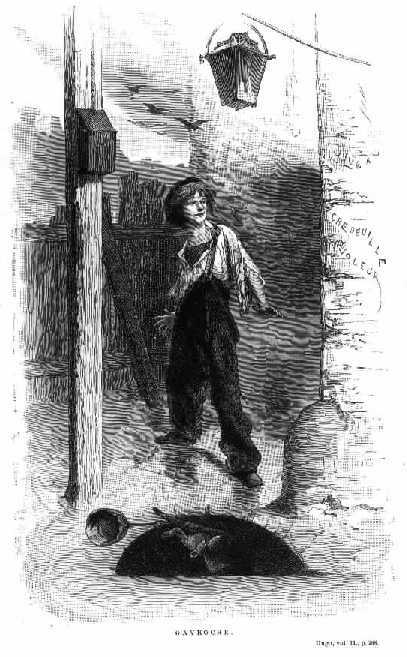 Image of Gavroche “after an original by Émile Bayard,” from an unidentified edition of Les Misérables, via the Pont-au-Change illustration gallery. This entry was posted in Book Commentary and tagged America, Gavroche, Parenting, Paris, Poverty on April 21, 2013 by Kelson Vibber.